Place beef in a shallow dish. Combine teriyaki sauce, red wine and garlic; pour over beef. 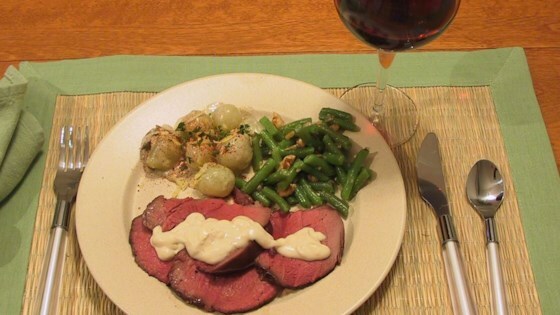 Allow beef to marinate in refrigerator for 30 minutes. Place tenderloin on broiler pan, and cook in preheated oven for 15 minutes. Reduce heat to 375 degrees F (190 degrees C), and cook for 30 to 40 more minutes, or to desired doneness. Allow to set for 10 minutes before slicing. In a saucepan over low heat, combine blue cheese, mayonnaise, sour cream and Worcestershire sauce. Stir until smooth; serve over sliced tenderloin. I just didn't like this sauce. I love blue cheese but this sauce was not good and I ended up throwing the whole thing out. What a waste. The meat was a little more well done than our family likes. Those non-blue cheese lovers thought the sauce was too strong.